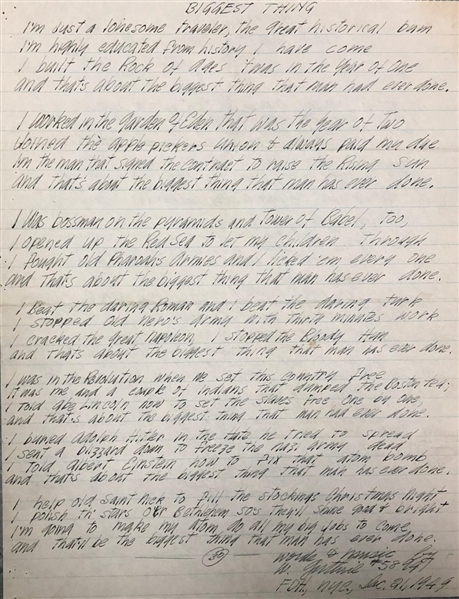 Incredible original autograph lyrics for his famous song Biggest Thing That Man Has Ever Done (aka. 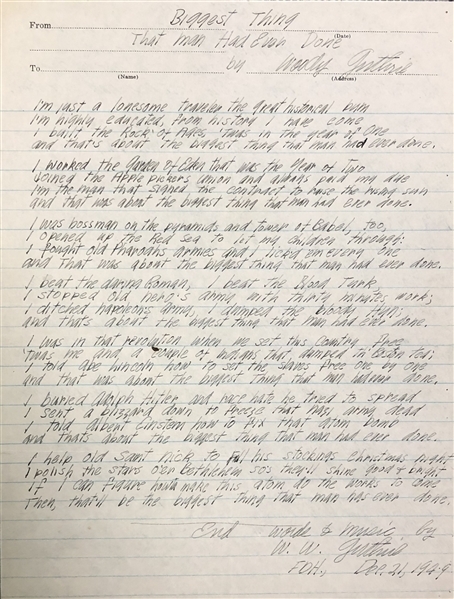 The Great Historical Bum), titled and signed at the top, and bottom both sides. one page, 7.75 x 10.75, December 21, 1949. Woodrow Wilson Guthrie) was an American singer-songwriter, one of the most significant figures in American folk music; his music, including songs, such as "This Land Is Your Land", has inspired several generations both politically and musically. He wrote hundreds of political, folk, and children's songs, along with ballads and improvised works. His album of songs about the Dust Bowl period, Dust Bowl Ballads, is included on Mojo magazine's list of 100 Records That Changed The World. Guthire inspired countless musicians and folk sinngers, one who lionized Guthrie is Bob Dylan, who used to visit him when he was younger, before Guthrie’s early death in 1967 from complications of Huntington's disease. 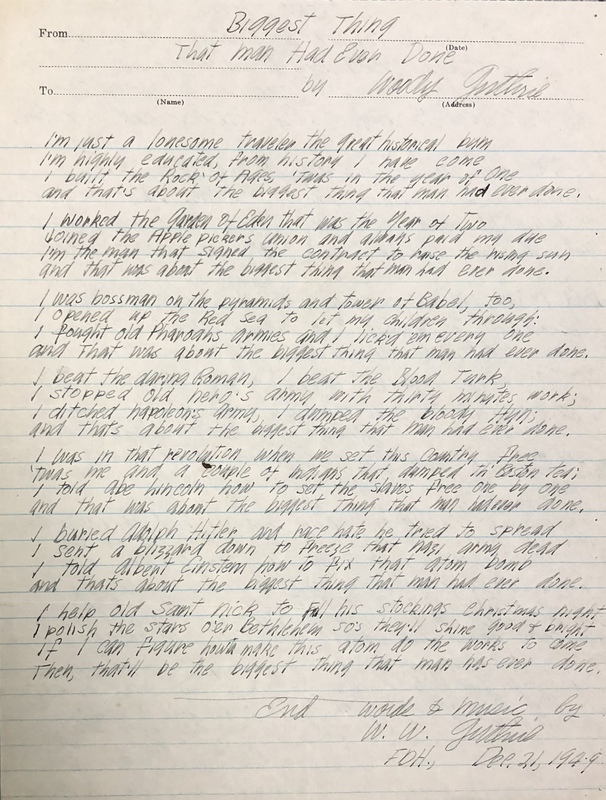 These original handwritten lyrics are written on both sides each time signed by Guthrie. Once on top of page and then two more times on the bottom of each side. He signed his name on bottom words & Music by W. Guthrie #58947 and other side words & music by W.W. Guthrie FDH, Dec.21, 1949. 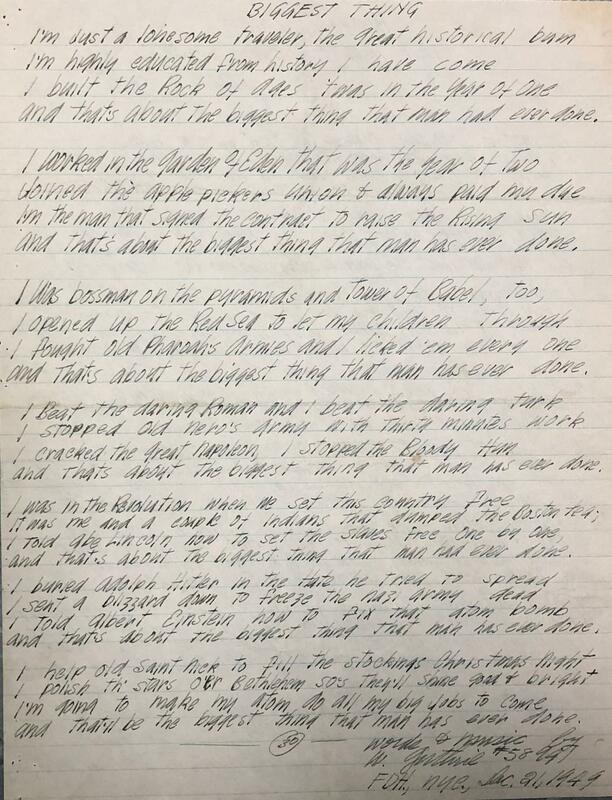 Biggest Thing That Man Has Ever Done by Woody Guthrie. And that was about the biggest thing that man has ever done. And every slave from sea to sea was all turned loose by me. I divorced old Madam slavery, and I wed this freedom dame. But Coulee is the biggest thing that man has ever done. The Coulee is the biggest thing that man has ever done. It takes all forty eight States for me to spread my quilt. Our kids are several millions now; they run from sun to sun. 'Cause this is about the biggest thing that man has ever done. And that will be the biggest thing that man has ever done.